If you are using frozen dough, thaw the dough so that you can roll it out. Cook both kinds of sausage together in a skillet until it is no longer pink. Drain off any excess grease and set aside. Take half the dough and roll it into a rectangle slightly smaller that a cookie sheet. 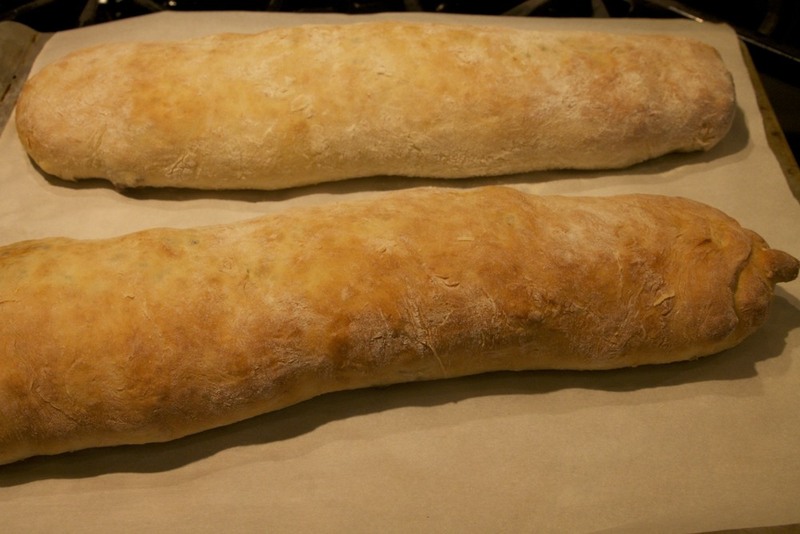 If you are using frozen dough, roll out one loaf. The dough mix is usually sticky, so sprinkle a little extra flour on your surface first to make it easier to roll out. Now take half of the cooked sausage and sprinkle it on the rolled out dough. Leave about a half inch or so around the edges. Now sprinkle on half of the chopped green onions. Now half of the grated Parmesan. Starting on the long edge farthest away from you, roll the dough towards you, over the sausage, onions, and cheese. Keep rolling until you get to the opposite long edge. When you get to the opposite dough edge, pinch the seams together along the ends and the edge to close everything. If it doesn't stick, just wet your fingers with a little water when you are pinching the dough and it should stick together. Transfer the roll onto a parchment covered cookie sheet, seam side down. Repeat with the remaining ingredients so that you have 2 loaves. Bake at 350 degrees for 20-30 minutes until the dough has turned a golden brown. Remove from the oven and slice and serve. If you are making this ahead of time, cool the loaves then wrap in aluminum foil and freeze, then thaw and reheat to serve. We serve this sausage bread with cheese grits and Blueberry Biscuit Coffee Cake and it's all delicious! Prepare roll mix according to package directions. Cook sausage and drain. Roll out ½ of dough into a rectangle slightly smaller than the size of a cookie sheet. Sprinkle cooked sausage, chopped green onions and parmesan over dough, leaving 1/2” around the edges. Roll dough up and pinch edges to seal. Bake at 350 degrees until brown. Posted in In The Kitchen and tagged with breakfast, sausage, brunch, sausage bread, make ahead. December 16, 2013 by Lynn Adams.